“To provide the most educative and enlightening material. To promote right thinking and Living among people. To strengthen the moral fibre of the society. To help acquire and sustain knowledge, success, health and happiness.” – this is the Mission Statement of Wisdom Magazine, a low-priced magazine for kids (and adults like me). 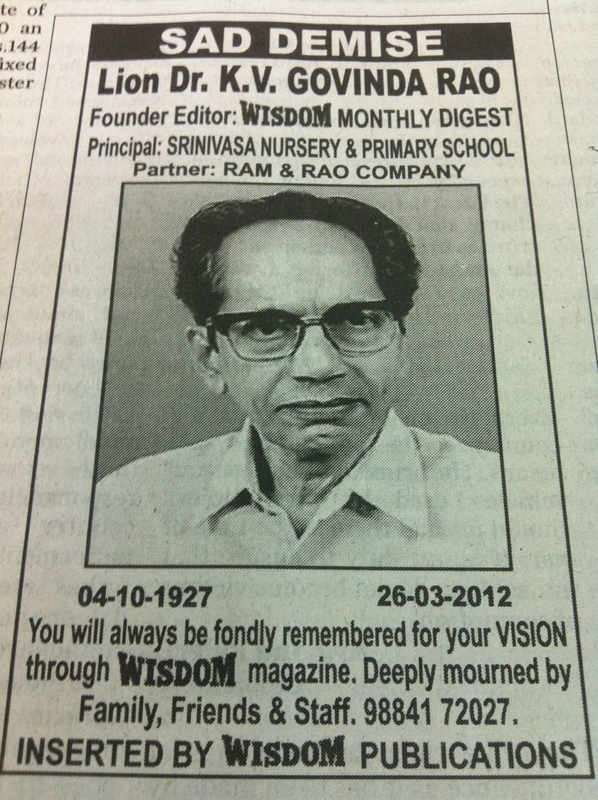 Wisdom was founded in 1973, and since then edited by Dr. K V Govinda Rao, until recently, when the visionary left us. I remember, as a kid, every time I passed a book stall, I threw tantrums at my father asking him to buy me comics, or story books. He, as a man of steel he is, every single time, grabbed the latest issue of Wisdom and slammed it in my hands. I don’t remember how, but as I grew up, my passion for comics was left behind, and I fell in love with this book. Even today, whenever I travel, I never forget to grab the latest issue of Wisdom. I have subscribed to numerous magazines in life, but I can safely say that, my relationship with Wisdom, has been the longest, and the sweetest. My early love for non-fiction started with Wisdom, and still continues. In-fact, as time progressed, I developed a strong reluctance towards reading mainstream fiction (I am considered an outcast among many friends, because I don’t read Chetan Bhagat). Well, Wisdom is not just a book. It is a testament of a dream, a vision- a vision of a happier, healthier and an enlightened, knowledgeable and awakened generation. Apart from English, Wisdom, as of date is published in Telugu and Braille. Name one other magazine in India which is published in Braille. Thanks to Dr K V Govinda Rao, Wisdom, for years, has been the regular dose of education, scientific innovation, culture, technological development, general knowledge, self-improvement and health, for kids like me who refused to grow up. A part of my life belongs to you sir! May your soul rest in peace, and more importantly, may your dreams- be fulfilled! This entry was posted in Culture, Education, Personal. Bookmark the permalink.